The contract, awarded to ALSYOM-SEIV (ALCEN group, France), launches the manufacturing phase for the beam source that will come on line in 2022 as part of the full-power, full-scale test bed for ITER neutral beam injection at the ITER Neutral Beam Test Facility in Italy. A supplier has been chosen for the fabrication of the MITICA beam source—a prototype of the ITER neutral beam heating beam source that will generate 40 A of negative hydrogen or deuterium ions. These negative ions, once extracted and accelerated to unprecedented energy levels (1MeV), will be injected as deuterium beams of 16.5 MW into the ITER plasma where they will transfer their energy by way of collision to contribute to plasma heating. MITICA (for Megavolt ITER Injector and Concept Advancement) is going up alongside a sister testbed SPIDER at the Neutral Beam Test Facility in Padua, Italy, in order to allow scientists to investigate challenging physics and technology issues and validate concepts before the neutral beam system—the most powerful in the world—is installed on ITER. 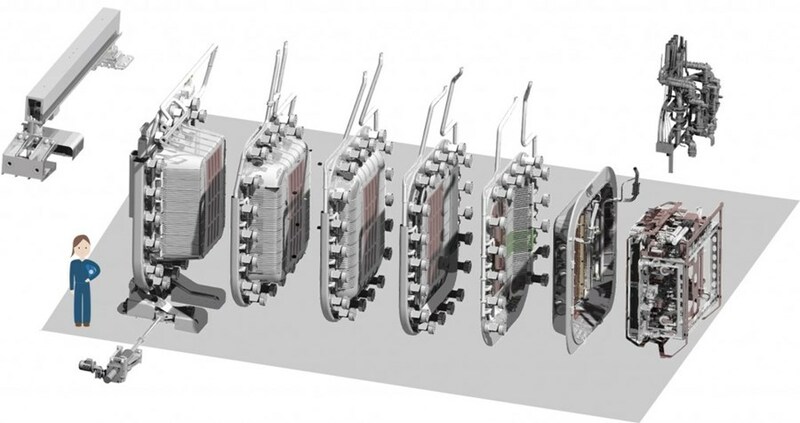 ITER will host two neutral beam injectors and space is reserved for a third in order to maintain an important potential for flexibility in the operation of the ITER facility should an upgrade be decided. The heating neutral beam source—situated inside the neutral beam injector—is 3 metres wide, 3 metres deep and 4.5 metres high with a total weight of 15 tonnes. Under the terms of a first-stage framework contract with the European Domestic Agency, three suppliers were in competition to finalize the MITICA beam source build-to-print design and to initiate manufacturing documentation. This first stage, which served to mitigate fabrication issues before the start of the manufacturing phase (stage two), has now concluded with the selection of ALSYOM-SEIV (ALCEN group, France) as supplier. See the full report on the website of the European Domestic Agency, Fusion for Energy.